2nd Annual Gala Gala Hey! The Drink and The Bored Vegetarian Present… 2nd Annual Gala Gala Hey! We had such a blast last year, so Gala Gala Hey! is back for more! Kate Lebo will be slinging her delicious fresh baked pies by the slice, as well as reading from her book A Commonplace Book of Pie. We’ll be celebrating the almighty apple all day long with fresh pie from Pie Stand, bobbing for apples, old timey music, cider on tap, apple pairings, corn hole and the return of the creepy masks! Kate Lebo of Pie Stand will be baking up five varieties to be sold by the slice for Gala Gala Hey! 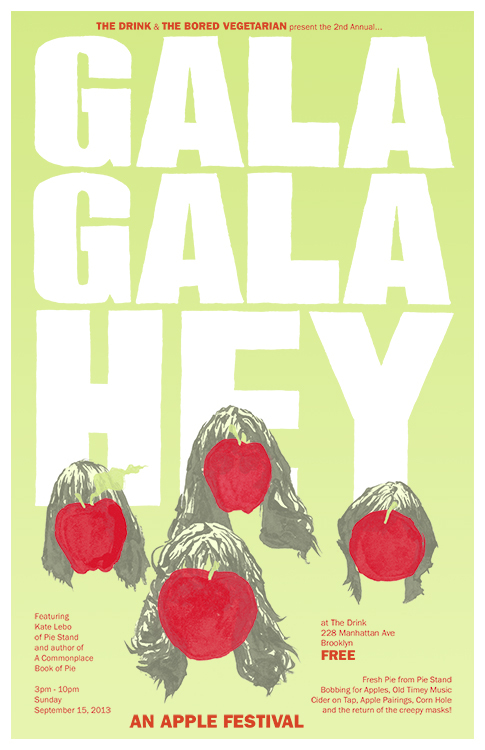 Gala Gala Hey! is free and open to the public. Kate Lebo is an award-winning baker and poet from Seattle, Washington. Lebo’s first book A Commonplace Book of Pie is a quirky collage of fact and fiction that combines humor, art, recipes, pop culture, and poetry to redefine America’s favorite dessert. Pie is a medium for conversation in this debut book from Chin Music Press, balancing Lebo’s technical baker know-how with lyrical ruminations on the real and imagined relationships between pie and those who love it. Kate’s writing has appeared in Best New Poets, Gastronomica, and Poetry Northwest among other journals, and she’s currently at work on a pie cookbook for Sasquatch Books, forthcoming in 2014. She teaches creative writing at Richard Hugo House and pie making at Pie School, her cliche-busting pastry academy. She also hosts Pie Stand, a social that uses pie to create conversations across communities. For more tasty treats, visit katelebo.com.